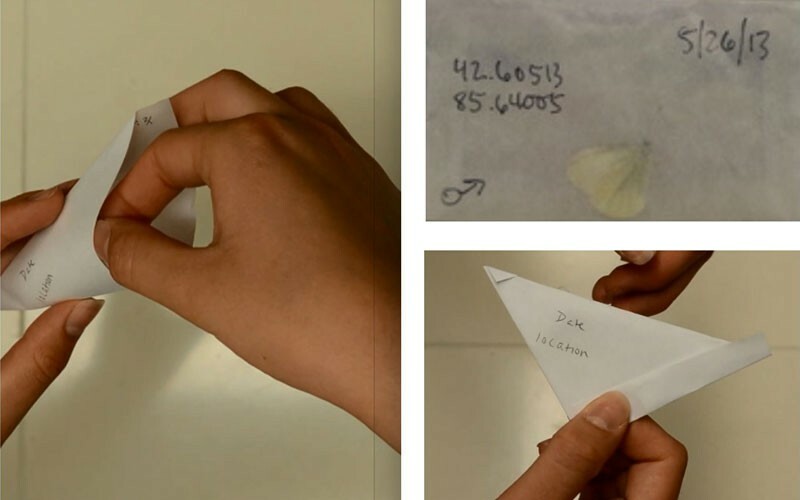 Catch and send us a few cabbage white butterflies, we sequence their DNA, capture their phenotype (photograph their wings), and together we’ll learn how this butterfly spread across the planet and is responding to changes in its environment. Find a cabbage white butterfly. They’re pretty much everywhere, but most common in urban environments (e.g., side of the road, near farms, in gardens, and meadows). Catch a cabbage white butterfly. It will help to have a net. It’s also easiest if you wait until they land, but they are one of the easier butterflies to catch (they are not too fast). This video will help you properly swing a butterfly net. Place each butterfly in their own individual envelope. 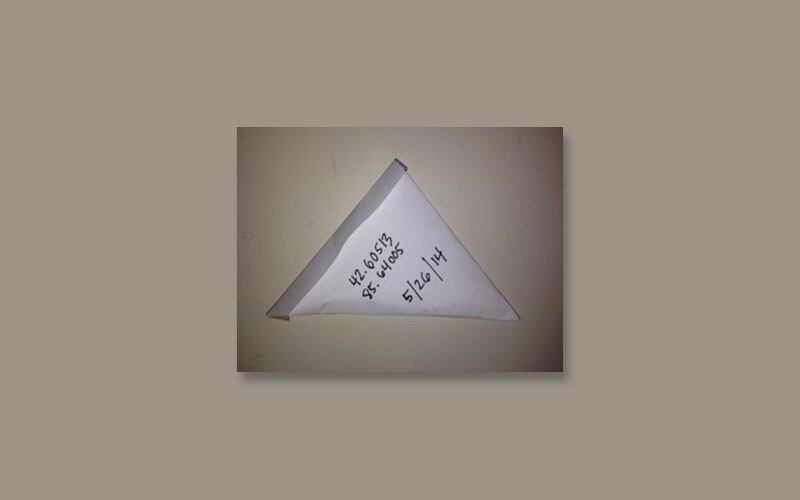 You can make these envelopes very easily. Check out our video on how to make an envelope. Record the date (month/day/year) and the location – watch a video on how to use your iPhone to get GPS coordinates or just record the nearest cross streets. Place the butterflies in the freezer overnight. This is a humane way to euthanize the butterflies, which is something we have to do in order to collect DNA from them. 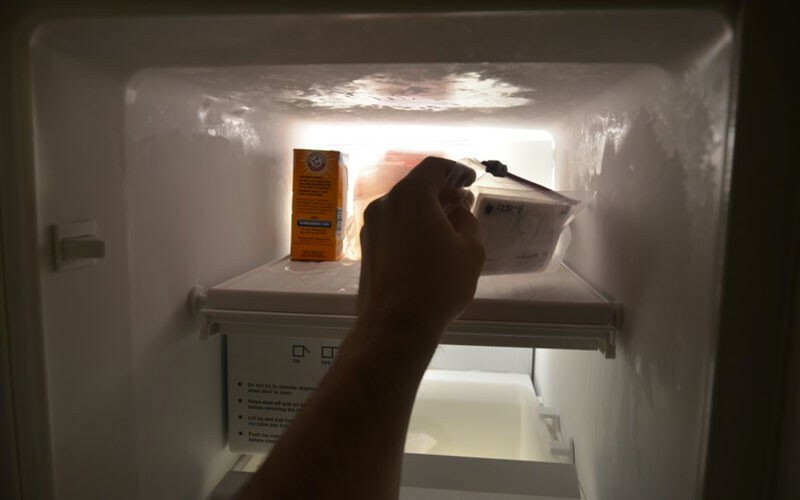 Avoid freeze-thaw cycles -- only put specimens in the freezer once. 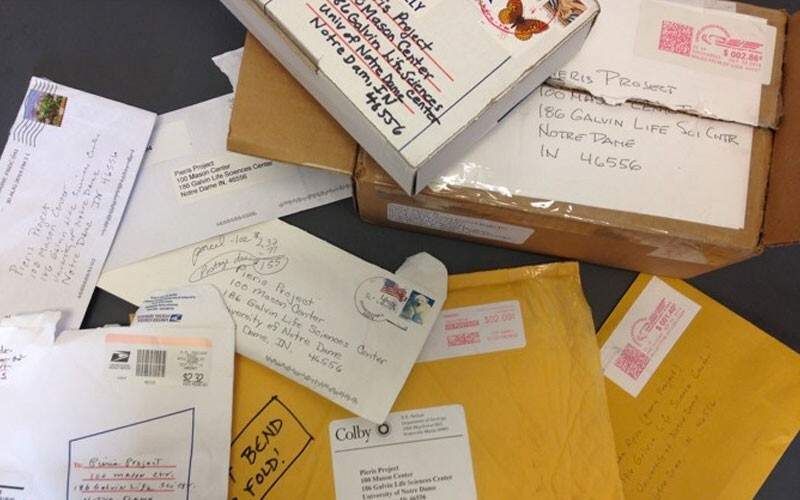 If you are not ready to send them, you can leave them in the freezer until you are ready to ship. Going from frozen to thawed multiple times will shear the DNA into very small fragments, which is very bad. Send us your butterflies. Be sure to use a crush-proof container (e.g., old Altoids or CD case, Tupperware container, candy box, … feel free to be creative) – for shipping the butterflies so that they don’t get squished. The shipping address is listed below. Inadvertently, humans have facilitated the movement of many species and some of these species end up having a negative impact on the places they invade. The small cabbage white butterfly is one such species that with the help of humans has been able to spread across the world. The silver lining is that we can use this “natural experiment” to learn how this organism (and others) adapt to changes in their environment. 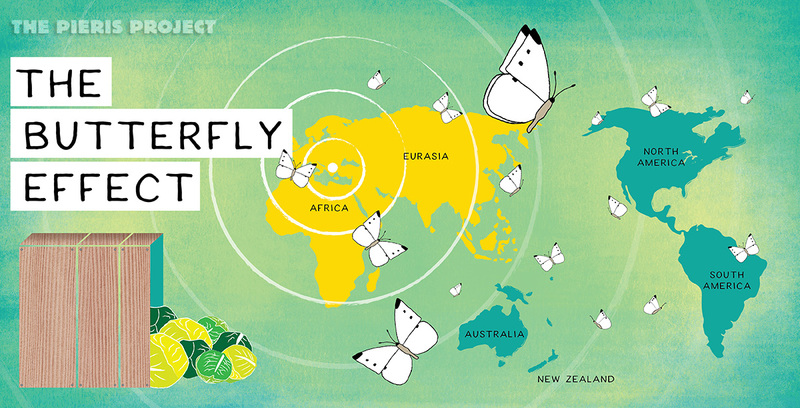 However, first we need to figure out the route of its spread – where did the butterflies in your backyard come from? Using DNA as a “forensic” tool, we can actually estimate this, similar to how scientists have reconstructed the spread of humans out of Africa tens of thousands of years ago. 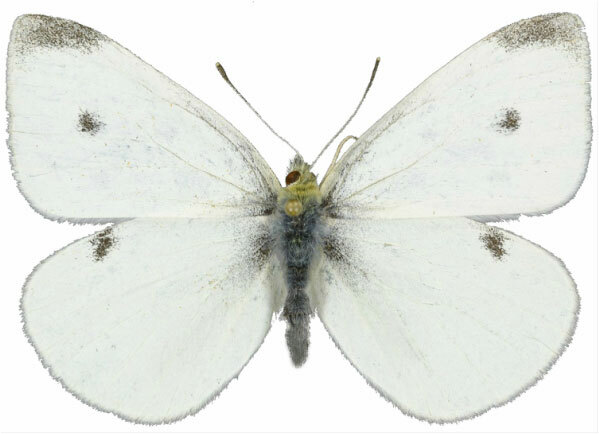 The small cabbage white butterfly (Pieris rapae) can be found almost everywhere humans live in North America. Chances are you have seen them in your backyard and just never noticed. For this project, you just have to collect a few with a butterfly net (or jar if you are stealthy and patient) and send them to us. We will then extract the DNA from each butterfly and sequence a portion of their mitochondrial genome. By sequencing these genes we can look for “foot prints” of where they came from. Once we have sequenced the butterfly, we will share the genetic information with you and let you have a try at figuring out where your butterfly originated. We’ll do this by sending you the genetic information of not just your butterfly, but also those from butterflies collected by other citizen scientists from all over the world. Don’t worry, we’ll make the analysis as simple (i.e., a 5 year old could do it) or as complicated (i.e., more for high school or college level) as you like. The amount of nitrogen these butterflies eat while caterpillars, affects the reflectance of their wings. Thus butterflies in areas with more nitrogen, such as near agricultural fields, should be more reflective than those from more natural areas. Students can test this hypothesis with the butterflies they collected. Using a spectrophotometer, we will measure the reflectance of each butterfly students send in. Students can then analyze their data and compare it to data from butterflies sent in from all over the world. First, we take pictures to catalog the wings of all the butterflies collected. These pictures allow us to measure the phenotype of each butterfly (size, coloration, etc.) so that we can explore questions about how the environment affects the shape, size and color of this species of butterfly. 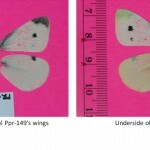 We photograph both the upperside (top) and underside (bottom) of wings and include a ruler so that we have reference for determining scale – we did to know how large 1 cm is in the photo (think of it as when you put something of a known size such as a coin in a photo to give people an idea the relative size of the object you are photographing). Each butterfly has its unique ID – “Pr-#” so that we can keep track of each butterfly. Why a hot pink background? We chose this color because it’s not present in the wings and therefore we are able to distinguish between the wing and the background – if there is a tear in the wing, like in the photo above, we can see it because the pink will show through (if we used a white background, we would never see these tears). Next, for each butterfly sent in, we extract some of their DNA. We do this by crushing up a few legs in an extraction buffer – chemical that helps to break apart (lyse) the cells and release the DNA inside. Then we sequence some of the genes this DNA encodes. This is done using a machine that will record each nucleotide (A,C,G,T) it reads along the DNA. This genetic information is how we will trace the footsteps of each butterfly back to the country from which it came. 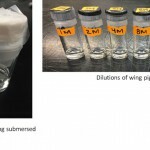 For some of the wings we also measure their reflectance using a wand spectrophotometer to give us an idea of how much pterin (the pigment that makes the wings white) is present. These white pigments are highly reflective, so by measuring how much light is being reflected by the wings we can estimate how much white pigment is present – basically, the more reflective, the more white pigment there is. Why is this important? Research has shown that the more nitrogen these butterflies eat, the more of this white pigment they can produce. 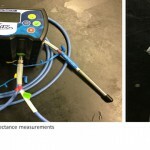 Therefore, by measuring the reflectivity of a butterfly’s wings, we can get an idea of how much nitrogen the butterfly was eating when it was a caterpillar. Using the butterflies sent in from all over the world, we can test the prediction that butterflies living near agricultural fields (where farmers tend to add lots of nitrogen to their crops) have wings that are more reflective (have more pterin). 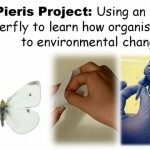 Dr. Sean Ryan is the Pieris Project director and founder. 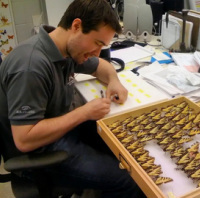 He received his PhD at the University of Notre Dame studying the impacts of climate change on butterfly populations in the Hellmann lab. He is also very excited by all things citizen science. In his free time he enjoys biking, photography and being a citizen scientist himself. Anne Espeset is a Ph.D. student in Matt Forister’s lab at the University of Nevada, Reno, studying how human-induced nutritional changes affects herbivores. Matt Eng is a Ph.D. candidate at University of Notre Dame and studies mosquitoes that spread breakbone fever, or dengue virus. 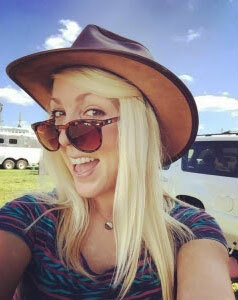 Christin Hardy grew up in a teeny, tiny place called Seven Springs, North Carolina, where livestock outnumber people. Her father is a farmer and her mother is an artist, so naturally Christin turned out to be an artist who loves nature, infusing it into her work and life. 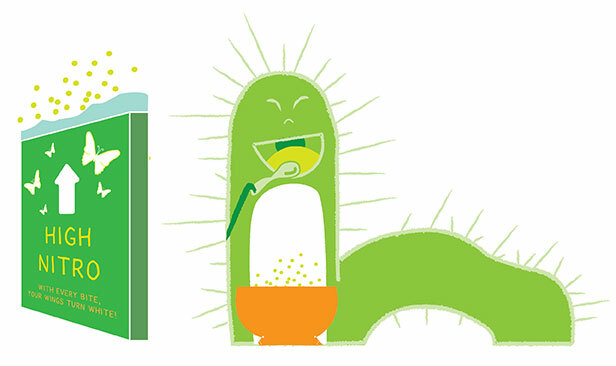 Currently she works for the NCDOT designing posters, banners and brochures, but her heart lies in explaining science through illustrations and graphic design. 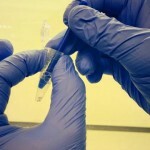 Crowdfunding Science: Sharing Research with an Extended Audience. CSCW ’15 Proceedings of the 18th ACM Conference on Computer Supported Cooperative Work & Social Computing, pages 31-43. 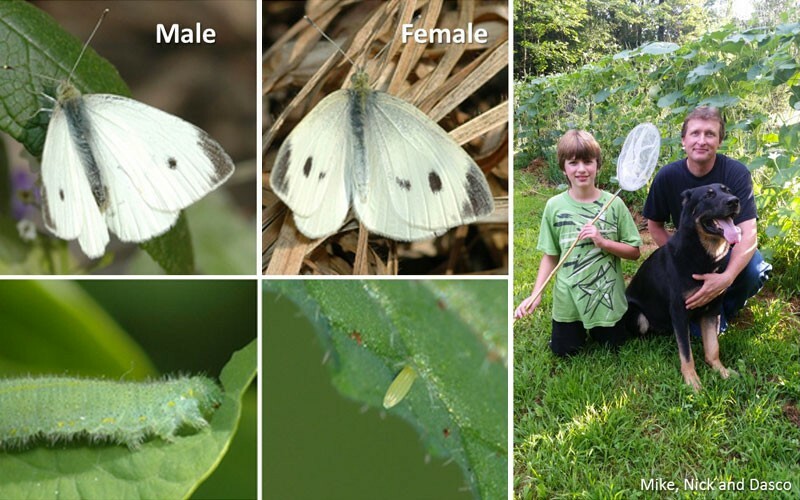 For a cabbage white butterfly, the amount of nitrogen it consumes as a caterpillar affects how white its wings will be when it metamorphoses into a butterfly. That’s because the pigment (called “pterin”) that makes the butterfly appear white, requires lots of nitrogen, so the more nitrogen a caterpillar eats, the whiter its wings will be. What this means is that we can look at a butterfly’s wings and figure out whether the plant it was eating was of good quality (high in nitrogen). So it turns out how we grow our food may be altering the brightness of this butterfly. Because nitrogen is also an important and limiting nutrient for plants, we have been giving them extra nitrogen, by applying fertilizers to our crops. 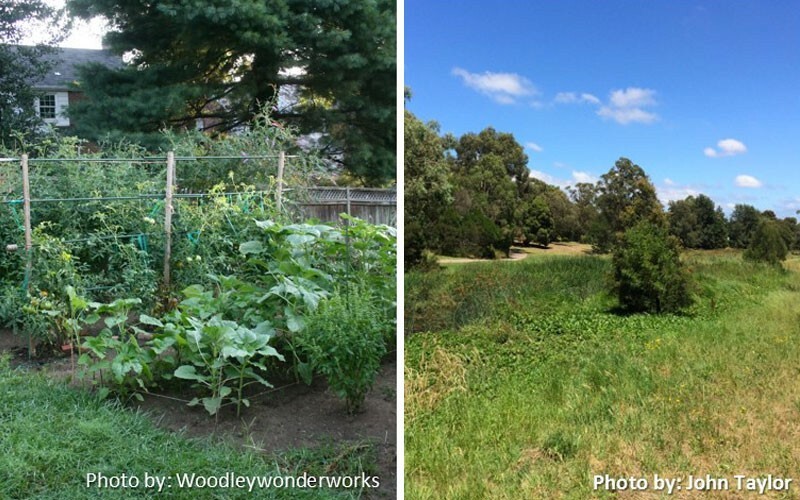 This has been great for food production. However, it’s possible that cabbage white butterflies that feed on or near agricultural areas are also getting extra nitrogen. Using your help in collecting butterflies from all over the world we can test the hypothesis that butterflies found near agricultural areas will have more white pigment in their wings than those found more “natural” areas.